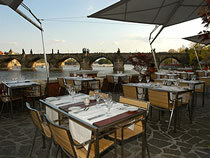 Hergetova Cihelna Restaurant is set in a prime location by the Vltava River, in the Lesser Town (Malá Strana) in Prague. This stylish, modern restaurant offers fine dining by the river, with lovely views of Charles Bridge and across to the Old Town. Hergetova Cihelna has an air of sophistication, but is not imposing. Soft but upbeat background tunes smooth out the formalities, making this a cool place to dine, and popular with people of all age groups. In the warmer months Hergetova Cihelna is particularly appealing, with its large terrace running alongside the river. During the day, guests can enjoy a drink and a splendid lunch in the sunshine. At night, view Prague lighting up across the water, warmed by the terrace heaters. The cuisine at Hergetova Cihelna is well prepared and superbly presented. Meat dishes range from a fine steak to the mighty 'Burger Royal'. There are also several fish dishes and salads on offer, plus a variety of tasty starters, and even some well priced children's meals. Hergetova Cihelna has an excellent wine list, carefully tailored by their in-house wine buyer to suit the food on offer. And prices for both food and drinks are reasonable, given the beautiful location. Families are welcome at Hergetova Cihelna, if you fancy some high class food in a child-friendly environment. There is a children's menu, and you can stroll down to the river afterwards to see the swans. Hergetova Cihelna is not a restaurant to rush. Enjoy a few drinks either side of your meal, either on the terrace or inside the restaurant, and then experience first-class cooking in impressive surroundings. Hergetova Cihelna is suitable for all types of group, for business occasions, birthday celebrations, hen parties and family gatherings. Advance reservations are essential.